Breast cancer is the most common form of cancer in the female population across the globe. Risk of breast cancer increases with age and is common in women aged 40 years and above. Morbidity rate of breast cancer is rapidly increasing in developed countries than developing countries. Incidence of breast cancer is rapidly increasing in geriatric population and rise in use of hormone replacement therapy (HRT), which results in increase in need for breast imaging diagnostic solutions worldwide. Mammography is considered as the standard detection method for breast cancer. Use of X-ray to screen breasts is known as mammography. Women below the age of 40 years are more sensitive to radiation than women above 40 years, and thus it is advisable to avoid mammogram for women below the age of 40. However, several breast cancer awareness organizations and similar societies established by governments recommend women who are at a high risk of breast cancer to undergo mammogram more frequently. The global mammography systems market was valued approximately US$ 1.5 Bn in 2016 and is anticipated to expand at a CAGR of over 8.0% from 2017 to 2025 to reach US$ 3.1 Bn by 2025. There are two types of mammography systems: analog mammography systems and digital mammography systems. Analog mammography is one of the early techniques used for breast cancer screening. The digital mammography system is also known as full-field digital mammography (FFDM). In this mammography system, the x-ray film which is used in the analog mammography system is replaced by electronics. This converts x-rays into mammographic pictures of the breast. The global mammography systems market has been segmented based on technology, end-user, and geography. In terms of technology, the global mammography systems market has been classified into analog mammography systems and digital mammography systems. In 2016, the digital mammography systems accounted for a major share of the market. The digital mammography systems segment is further bifurcated into 2-D mammography systems and 3-D mammography systems. High incidence of breast cancer and rise in geriatric population are likely to drive the market during forecast period. According to World Cancer Research Fund, the number of breast cancer cases are likely to reach 2.1 million in 2030. Moreover, public mammography screening programs are anticipated to boost the global mammography systems market. As a part of the federal budget 2013-2014, the Government of Australia announced US$ 55 Mn for the free national breast screen program. Based on end-users, the global mammography systems market has been segmented into hospitals, ambulatory surgical centers, educational & research institutes, and diagnostic centers. Geographically, the global mammography systems market has been divided into five regions: North America, Europe, Asia Pacific, Latin America, and Middle East & Africa. North America accounted for the largest share of the global mammography systems market in 2016, followed by Europe. This is attributed to developed economy, advanced health care infrastructure, and awareness among the population regarding breast cancer screening and diagnostics. The digital mammography systems segment accounts for a large share of the market in North America and Europe. Asia Pacific is expected to be a promising market for mammography systems due to increasing population, rising health care facilities, and developing economies. Additionally, Asia Pacific is focusing on increasing cancer diagnostics and treatment centers, which is anticipated to drive the market during forecast period. Growth of the market in the Middle-East and Latin American is also encouraging manufacturers to expand their business in these regions. This is anticipated to propel the mammography systems market in these emerging regions during the forecast period. Key players operating in the global mammography systems market are Hologic, Inc., Allengers Medical Systems Limited, FUJIFILM Holdings America Corporation, Konica Minolta, Inc., PLANMED OY, Siemens Healthcare Private Limited, Koninklijke Philips N.V., and GE Healthcare. These players adopt organic and in-organic growth strategies to expand their product offerings, strengthen their geographical reach, increase customer base, and garner market share. For instance, in 2017, FUJIFILM Europe announced the launch of new option for AMULET Innovality digital mammography unit. Fujifilm developed a new reconstruction process, which is expected to improve image quality and reduce radiation dose. This report on the global mammography systems market analyzes the current and future prospects of the market. The report comprises an elaborate executive summary, including a market snapshot that provides overall information of various segments and sub-segments. The research is a combination of primary and secondary research. Primary research formed the bulk of our research efforts along with information collected from telephonic interviews and interactions via e-mails. Secondary research involved study of company websites, annual reports, press releases, stock analysis presentations, and various international and national databases. The report provides market size in terms of US$ Mn for each segment and sub-segment for the period between 2017 and 2025, considering the macro and micro environmental factors. Growth rates for each segment within the global mammography systems market have been determined after a thorough analysis of past trends, demographics, future trends, technological developments, and regulatory requirements. A detailed qualitative analysis of factors responsible for driving and restraining the market and future opportunities have been provided in the market overview section. This section of the report also includes market attractiveness analysis that provides a thorough analysis of the overall competitive scenario in the global mammography systems market. Market revenue in terms of US$ Mn for the period between 2015 and 2025 along with the compound annual growth rate (CAGR %) from 2017 to 2025 are provided for all the segments, considering 2016 as the base year. Market size estimations involve in-depth study of various segments of the global mammography systems market. The global mammography systems market is segmented based on technology, end-users, and geography. In terms of technology, the global mammography systems market is classified into analog mammography systems and digital mammography systems. The digital mammography systems segment is further categorized into 2-D mammography systems and 3-D mammography systems. In terms of end-users, the global mammography systems market is segmented into hospitals, ambulatory surgical centers, educational & research institutes, and diagnostic centers. 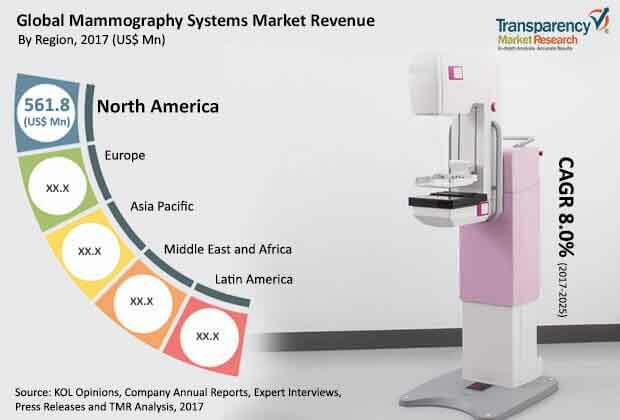 Based on geography, the global mammography systems market is divided into North America, Europe, Asia Pacific, Latin America, and Middle East & Africa. Additionally, regions have been further segmented by major countries. The report also profiles major players in the mammography systems market based on various attributes such as company overview, financial overview, SWOT analysis, key business strategies, product portfolio, and recent developments. Key companies profiled in the report include Hologic, Inc., Allengers Medical Systems Limited, FUJIFILM Holdings America Corporation, Konica Minolta, Inc., PLANMED OY, Siemens Healthcare Private Limited, Koninklijke Philips N.V., and GE Healthcare.